I have to tell you, being asked to serve on Stampin' Up! 's Advisory Board was probably one of the greatest honors I've ever received. Being asked to serve two years in a row just blew me away - such a trememdous blessing. I truly love the work we do on the board and love that I have the honor of being a voice for our amazing demonstrator base and for our company as well. But you want to know the really best part? It's the friendships that I've formed with the ladies I'm serving with. Last year, and this year, most of the ladies on the Board with me were known to me, but not in my circle as we rarely crossed paths. But the crucible of this task draws us together like no other, creating for me, friendships that I know will be there always. As much as I treasure the relationships and bond I formed with my girls last year, this year brings a whole new set of blessings and friendships. It's really a wonderful experience and I know, the highlight of my demonstratorship and a most wonderful gift. Here are a few photos of my girls from this year at the Advisory Board Breakfast at Leadership this month. Here's a fun group shot of us around the fountain outside the Old Hickory Steakhouse where our breakfast was held. I almost didn't make the breakfast! I'd set my wake up call the night before for my regular time, not thinking about the breakfast being early! But, I was only a 1/2 hour late, so I still got to eat and spend time with my girls! 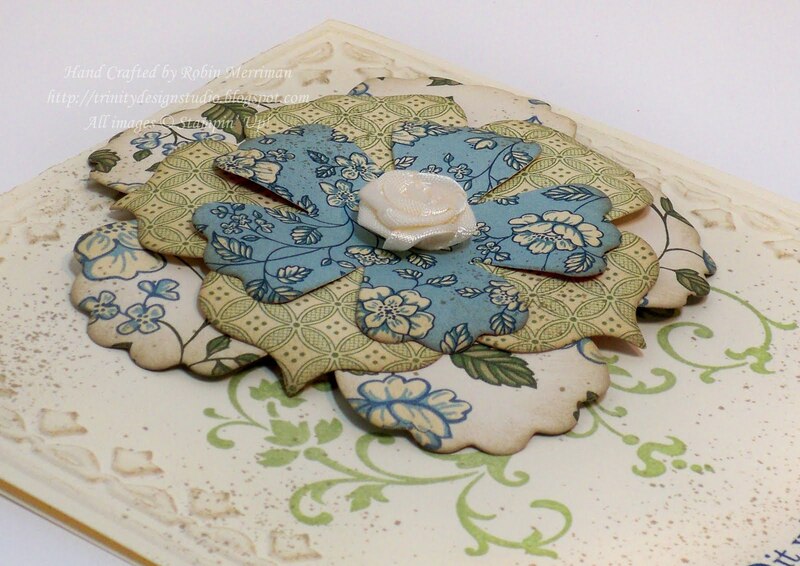 I used lots of fun stuff from the new Occasions Mini on this one - the new Fun Flowers Big Shot die, Springtime Vintage Designer Paper, the gorgeous Satin Rosettes and that yummy new Framed Tulips Embossing folder. I used the Elements of Style stamp set and the Cottage Garden stamp set with Pear Pizazz, Not Quite Navy and Crumb Cake ink. The dimension on the flower was created by curling the petals with my Bone Folder and I added the antiquing by spritzing on a little Crumb Cake ink. The girls loved their cards and that made my heart happy - just like their friendship! Beautiful card, Robin! I agree...the friendships I've made thru my Stampin' Up! business are PRICELESS! (Including yours!) Thank you for being our voice on the Advisory Board! Truly stunning, Robin! I'm sure even more so in person. What a lovely card to give these special people. As I said before in your e-mail; this card is so beautiful. 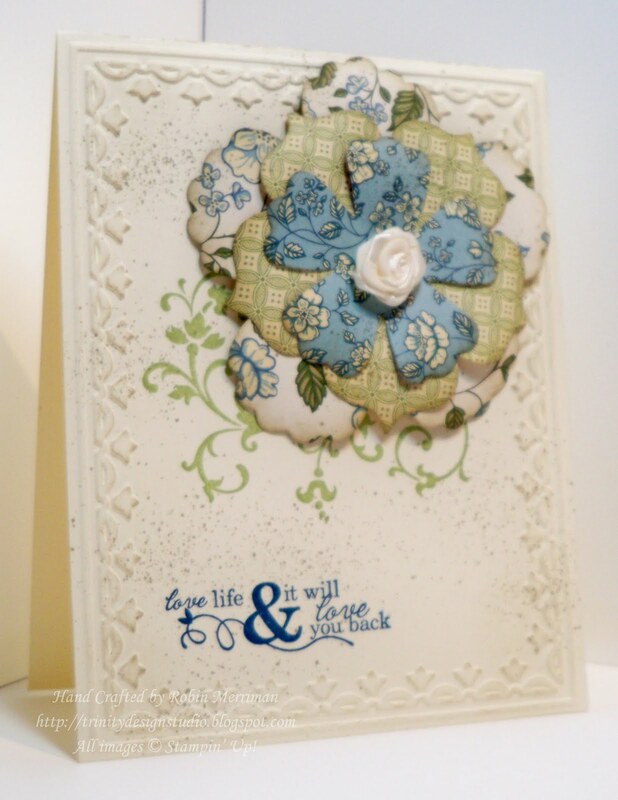 Love the layered DSP patterns you picked for your flower and the whole layout of the card!! Wow!!! You keep showing me these cute cards, and I'm going to go broke thinking of everything that I want from the catalog because of them!! LOL....Anyway, what a beautiful card!! I might just have to break down and buy that Big Shot!! You're right...friendship is "priceless", and the people I've met through Stampin' Up are truly amazing. I'm lucky to have met them and call them friends! I saw this post a few days ago, but wanted to come back and leave a comment. Your card is really lovely! It is the first card I've seen using the build a blossom punch that actually tempts me! And there's quite a few out there, but yours is tops, I think!